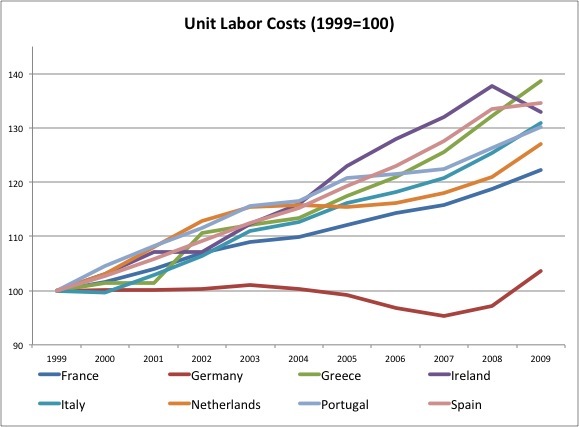 To add yet one more perspective on how significant the shift to austerity among advanced economies has been since 2009, I decided to add the Euro series to a chart from Paul Krugman's blog. 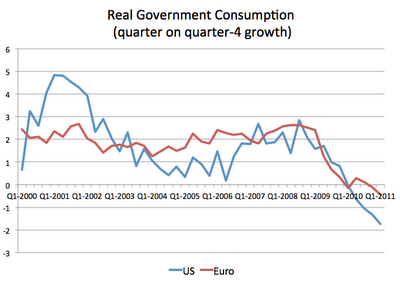 This is real government consumption for both the US and the Euro (17 countries) area. It is remarkable how the Euro area and the US display a strong coordinated contraction in fiscal policy starting in the first quarter of 2009 that accelerates during 2010 and 2011. This has come at a time when advanced economies (and the world) were starting a recovery from a very deep recession. No surprise that the recovery is not going as well as some thought and some countries are going back into recession. The fact that ideology matters in the economic policy debate should not be a surprise to anyone. But the influence that ideology has has in some of the economic analysis we have seen since the beginning of the financial crisis has led to completely contradictory statements about the facts behind the causes and potential remedies to the crisis. When he (Obama) came into office, he favored a massive injection of new government spending into the economy in the name of “stimulus” — counter-cyclical federal activity aimed at offsetting depressed consumer demand emanating from a recession-battered private sector. The net result provides little if any boost to aggregate demand because the states — and to some extent private citizens — simply pocket the federal money and reduce their deficits and debts. Meanwhile, what federal taxpayers get is a permanent increase in the size of government. We have all heard similar statements before which tend to be supported by references to $800 billion to $1 trillion stimulus packages and bailouts both in the US and Europe. But have we really see an unusual expansion of government size? Quite the contrary. As I argued in a previous post, what we have seen during the current crisis is exactly the opposite. Relative to previous crisis government spending has been growing at a much slower rate this time. Paul Krugman makes an even more interesting comparison in blog, a comparison that reveals how inaccurate the above statement is. He compares government employment under the Obama administration to the Bush and Clinton administrations. 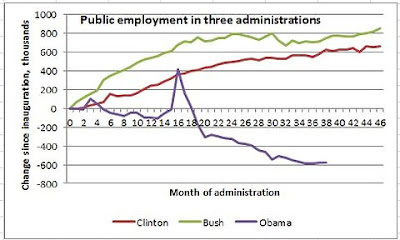 The Bush administration is probably the most relevant comparison because it also started in the middle of a recession. 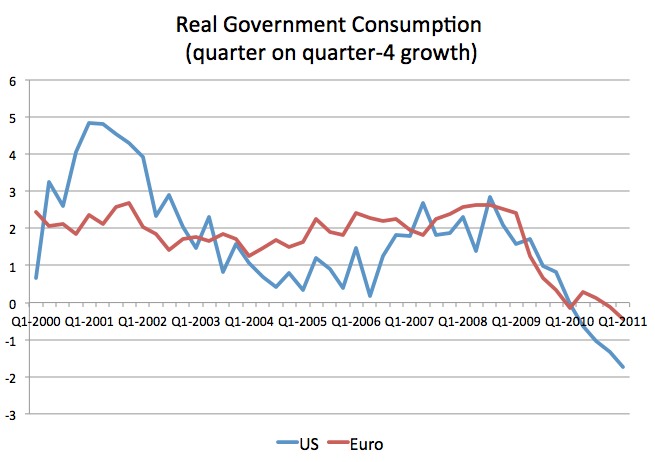 Here is the chart from Krugman's analysis. The data speaks for itself. 40 months into the Obama administration, the number of government employees (all levels of government) has gone down by 600,000. During the Bush administration the number had increased by about 700,000. A difference of 1.3 million. So where is the increase in government size? P.S. A few months ago I wrote a post with almost the same title discussing the mistaken view that some economists have of the link between taxation and labor market outcomes in Europe - another debate that seems to be heavily influenced by ideology and not enough by facts. Out of the many signs that the US economic recovery is not as strong as previous ones, the variable that possibly best demonstrates the weakness of the recovery is the stagnant employment to population ratio. This ratio summarizes two labor market variables: the unemployment rate and the participation rate. A declining ratio indicates that out of the available population, we are using fewer resources either because workers cannot find jobs (high unemployment rate) or because they are giving up and leaving the labor force (low participation rate). The current level of the employment to population ratio in the US remains at a very low level (by recent historical standards) and has not increased since the recovery started. This behavior is very different from what we have witnessed in previous recoveries. 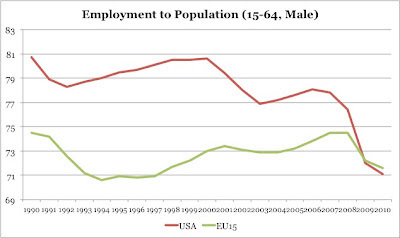 The dynamics of the employment to population rate are not just cyclical. We have seen several interesting trends over the last years which can possibly explain the abnormal behavior during the current crisis. Albanesi, Sahin and Abel provide an in depth analysis of the dynamics of the US labor market during recessions. The authors argue that some of this difference can be explained by the different behavior of he female and labor force participation rates as well as demographic factors. I am borrowing the picture below from their analysis showing how the employment rate is much flatter than in any previous recovery. Their analysis provides a good amount of detail regarding the US labor market, but how does it compare to other countries? 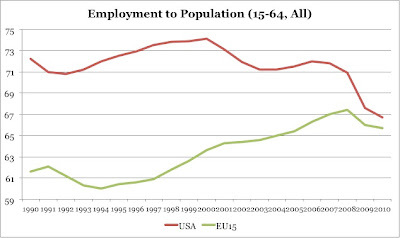 In the charts below I compare the behavior of the US labor market to the European Union labor market (I chose the 15 countries that formed the European Union in 2002 a smaller group that the current 27 members). 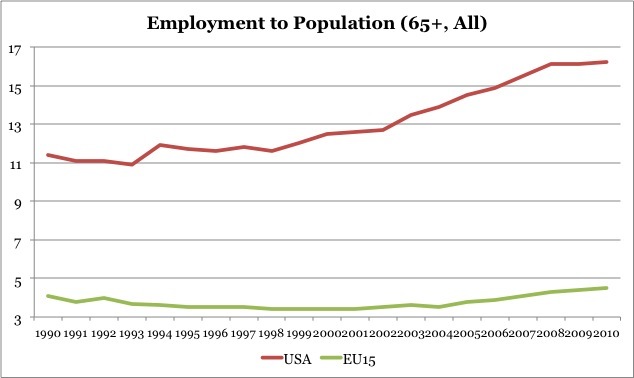 The overall employment to population rate (for the population between 15 and 64 years old) in the EU has been converging to that of the US. This convergence started after 1995. In the US we see a stable ratio prior to the 2001 recession followed by an overall declining trend that accelerates during the post 2008 crisis. 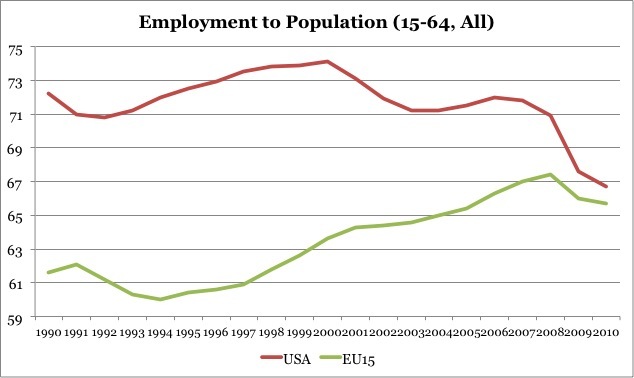 In Europe the mid 90s show an increasing employment rate that stops post 2008 but not as dramatically as in the US. 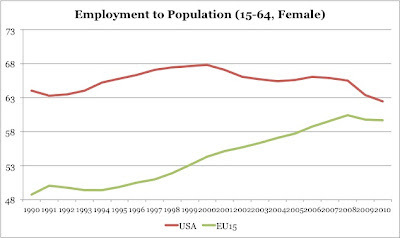 By gender, we see very different patterns although both pointing to convergence of labor markets. 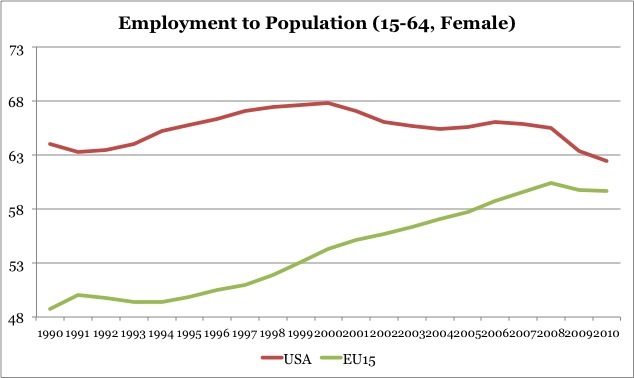 In the case of female workers, the US displays a flat or declining ratio (but at a high level), while Europe shows a strong upward trend. 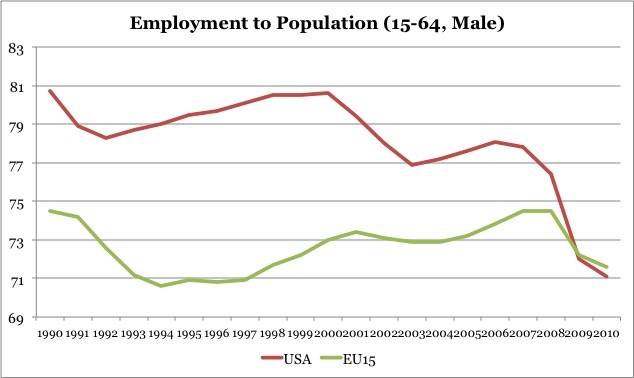 In the case of make workers, the EU trend is flat but there is a strong decline in employment rates in the US. There are many other ways to cut the data, all of them interesting. Below are two charts where I look at a specific age range. For workers in the 35-44 range (the analysis it would be similar for 45-54), we see strong increases in the EU employment rates that bring the ratio above that of the US. 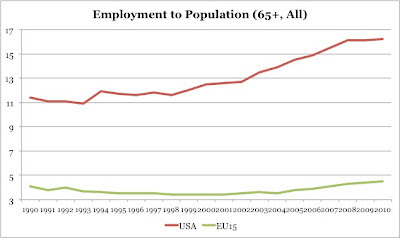 If we look at workers over 65 we see that not only the US has a much higher employment rate but that it has been increasing relative to the EU number that remains low and at a similar level as in 1990. 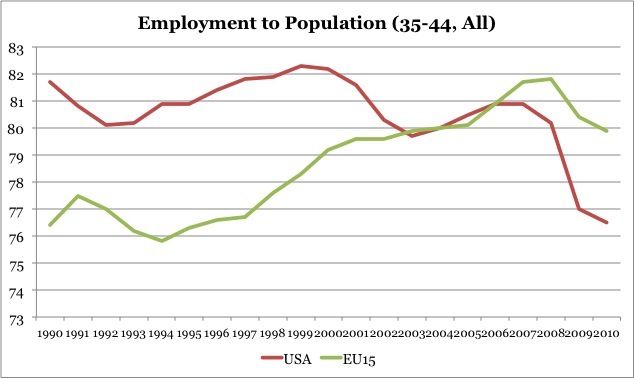 Overall, the US-EU comparisons of labor markets reveals that Europe has caught up with the US when it comes to employment rates, something that was not expected in the 90s where the US labor market was seen as an example of a dynamic market and the distance between the two kept growing. For some age groups (between 35-44) not only there is convergence but the EU rates are now clearly above those in the US. However, the US maintains the lead in workers close or "over" retirement age, with a gap that has increased over time. Arnab Das and Nouriel Roubini write today in the Financial Times a commentary suggesting that Euro members should get a divorce (they call it an "amicable divorce settlement"). The current policies will not work and the only solution is the break up of the Euro area to allow some of the economies in trouble get a boost from a depreciation of their (newly created) currencies. 1. Portugal, Ireland, Italy, Greece and Spain to abandon the Euro. 2. A system of fixed exchange rates (or managed exchange rates) to be introduced in the transition where the ECB will play a strong role defending the announced targets. This system will provide during the transition, the necessary adjustment to exchange rates. 3. After a transition, all central banks will implement congruent inflation targets to avoid competitive devaluations. 4. Contracts made under domestic laws will be renominated to the new currency. Contracts made under foreign law will remain in Euros. As I said, it is good to see a proposal with details on how to make the break-up of the Euro area work - and also one that admits its difficulties. Although their arguments are good I remain unconvinced that this would be a good solution. I disagree with their assessment that a one-time shift in intra-Euro exchange rates would generate enough growth. And I have (like anyone else) some "cheap" criticisms about why there are still details that need to be worked out and that in its current form this proposal cannot work. Let me start with the disagreement on their analysis. At the center of their argument there is a a logic that there is a fundamental misplricing going on in the Euro area. Some countries have lost competitiveness and we need to reset some relative prices back to where they belong to allow for the necessary external rebalancing. This is a standard macroeconomics textbook argument about why systems of fixed exchange rates tend to be unstable and likely to generate misalignments in relative prices. But the Euro area is not a system of fixed exchange rates where national central banks run independent monetary policy. It is a group of countries (regions?) that share a currency. Inflation does not exist at a macroeconomic level in Greece or Spain. Inflation can only be seen as a microeconomic phenomenon: some prices move in directions that make the factors behind those prices too expensive. We now need to reset to reset those prices to the right level and internal devaluations does not work fast enough so a depreciation of the exchange rate will be a much better tool. But depreciation of the exchange rate means that all local prices are being reset in the same direction by the same amount? Is this optimal? Is this the right change in relative prices that these countries need? I do not have a perfect answer to this question but I feel uncomfortable making the argument that all domestic prices or wages in these countries are too high. 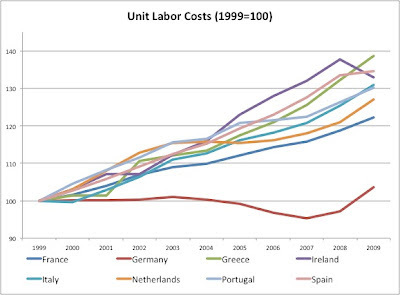 The argument that Greece or Portugal or Spain have lost competitiveness relative to the other Euro countries since the launch of the Euro has been made many times before but as I have argued earlier in this blog, the data is not as clear as many think. What we have seen is one country (Germany) going through a process of increased productivity with limited wage growth and relative to other countries they have managed to reduce their relative unit labor cost. See graph below that I have shown earlier in this blog. Germany is the outlier and not Southern Europe + Ireland. Looking at the performance of exports during the same period of time provides us with a similar message. 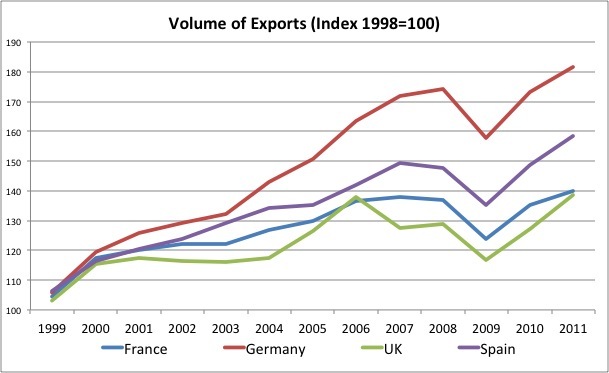 Let's compare (volume of) exports of four European economies: Germany, France, Spain and the United Kingdom post 1999. 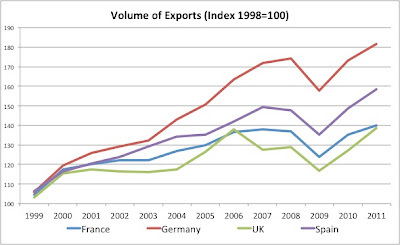 Yes, Germany's exports grew faster than any of the other countries but there are small differences between France, the UK and Spain. And out of the three, the one that showed stronger exports growth was Spain. So how can we be so sure that we need to reset the relative prices between Spain and some of those other Euro countries? One can argue that maybe the past performance was fine but that given the current difficult economic situation of some of these countries, a depreciation will be helpful for a while. This argument is much less convincing. It cannot be that a depreciation is always good for growth (otherwise why don't we depreciate by 99% the value of their currencies?). The argument needs to be one of setting some relative price to the correct level not simply a one-way argument towards depreciated currencies (the authors agree with this statement when they talk about avoiding competitive devaluations after the transition). 1. How are the new exchange rates decided? And I do not mean the day of the conversion (this is arbitrary and meaningless) but after that. The only way to make this meaningful is by creating a depreciation the months that follow the exit of the Euro area. The authors suggest that it will be a controlled depreciation. Who will make that decision? 2. The moment the depreciation happens, these countries will be poorer as all their imports will be more expensive (e.g. price of oil will jump by whatever is the amount of depreciation of their currency). How will this impact economic growth (consumption, investment,...)? We all understand that there can be potential benefits to exports growth in some sectors but are we sure this is going to work in the short-run? Why is this an important question? Because the debt of governments will be at least as high as today after leaving the Euro. Without growth, the fiscal problems of Spain or Italy will be as bad or worse than today. Are we sure that the loss of confidence in their currencies combined with the immediate shock of making everyone else poorer is going to be compensated fast enough by increasing exports? 3. The authors suggest that contracts under foreign law will still be denominated in Euros. The details matter here. Suppose we convert all the government debt of Italy to the new Lira. The moment the Lira depreciates, the foreign investors will see a loss in their investment. From the perspective of the Italian government nothing has changed. The value of the debt is in Liras and so are all its future revenues (so the Debt to GDP ratio is the same as before). But it is very likely that interest rates will be higher because of the uncertainty and lack of confidence. Will Italy be able to avoid default? Are we sure that exports will grow so fast to compensate for all these costs or risks? I remain skeptical of the ability of exports to react significantly and fast enough to compensate for all the potential costs.